Mangosteen also known as Queen of Fruits. There is a legend about Queen Victoria offering a reward of 100 pounds sterling to anyone who could deliver to her the fresh fruit. Although this legend can be traced to a 1930 publication by the fruit explorer, David Fairchild, it is not substantiated by any known historical document, yet is probably responsible for the uncommon designation of mangosteen as the “Queen of Fruit”. The purple mangosteen colloquially known simply as mangosteen, is a tropical evergreen tree believed to have originated in the Sunda Islands and the Moluccas of Indonesia. It grows mainly in Southeast Asia, and also in tropical South American countries such as Colombia, in the state of Kerala in India and in Puerto Rico where the tree has been introduced. The tree grows from 6 to 25 m (20-82 ft) tall.The fruit of the mangosteen is sweet and tangy, juicy, and somewhat fibrous, with an inedible, deep reddish-purple colored rind (exocarp) when ripe. In each fruit, the fragrant edible flesh that surrounds each seed is botanically endocarp, i.e., the inner layer of the ovary. The edible endocarp of the mangosteen is botanically defined as an aril with the same shape and size as a tangerine 4-6 centimetres in diameter, but is white. 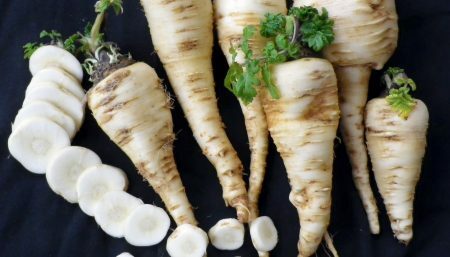 The circle of wedge-shaped arils contains 4-8, rarely 9 segments, the larger ones harbouring apomictic seeds that are unpalatable unless roasted. Often described as a subtle delicacy, the arils bear an exceptionally mild aroma, quantitatively having about 1/400th of the chemical constituents of fragrant fruits, explaining its relative mildness. The main volatile components having caramel, grass and butter notes as part of the mangosteen fragrance are hexyl acetate, hexenol and a-copaene. On the bottom of the exocarp, raised ridges (remnants of the stigma), arranged like spokes of a wheel, correspond to the number of aril sections. Mangosteens reach fruit-bearing in as little as 5-6 years, but more typically require 8-10 years. The aril is the white part of the fruit containing a mild flavor that makes the fruit popular for eating. 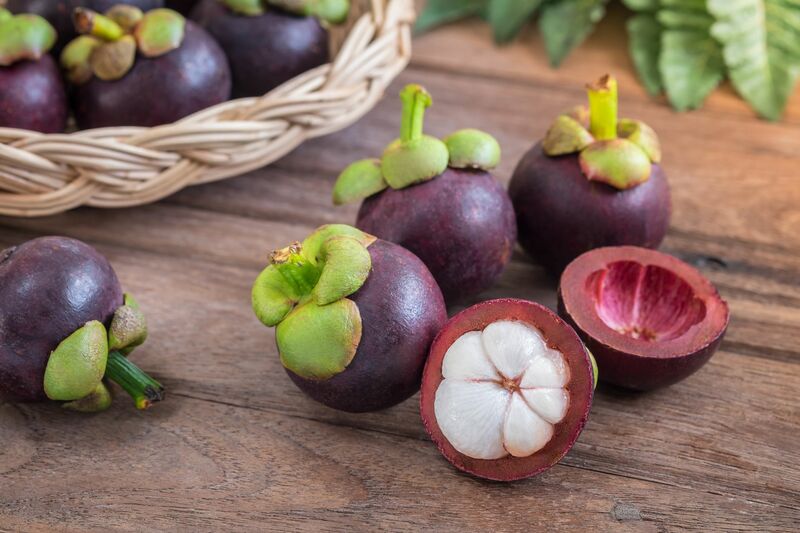 When analyzed specifically for its content of essential nutrients, however, mangosteen nutrition is modest, as all nutrients analyzed are a low percentage of the Dietary Reference Intake. Mangosteen peel contains xanthonoids, such as mangostin, and other phytochemicals having antioxidant properties in vitro. Some studies demonstrated that juice containing mangosteen peel extracts may reduce blood levels of C-reactive protein, a biomarker of inflammation. Research on the phytochemistry of the plant without human clinical study is inadequate to assure the safety or efficacy of its use as a supplement. Some mangosteen juice products contain whole fruit puree or polyphenols extracted from the inedible exocarp (rind). The resulting juice has purple colour and astringency derived from exocarp pigments. Due to restrictions on imports, mangosteen is not readily available in certain countries. Although available in Australia, for example, they are still rare in the produce sections of grocery stores in North America and Europe. Following export from its natural growing regions in Southeast Asia, the fresh fruit may be available seasonally in some local markets like those of Chinatowns. Mangosteens are available canned and frozen in Western countries. Without fumigation or irradiation to kill the Asian fruit fly fresh mangosteens had been illegal to import into the United States until 2007. Freeze-dried and dehydrated mangosteen arils can also be found. Upon arrival in the US in 2007, fresh mangosteens sold up to $45 per pound in speciality produce stores in New York City, but wider availability and somewhat lower prices have become common in the United States and Canada within two or three years. Fresh mangosteens sell for around $8 a pound in the US. Despite efforts described above to grow mangosteen in the Western Hemisphere, nearly the entire supply is imported from Thailand. Canned mangosteens are also available in the United States for a much lower price, but much of the fruit’s unique flavor is lost in the canning process. In his publication, “Hortus Veitchii”, James Herbert Veitch says he visited Java in 1892, “to eat the Mangosteen. It is necessary to eat the Mangosteen grown within three or four degrees of latitude of the equator to realize at all the attractive and curious properties of this fruit.” The journalist and gourmand R. W. Apple, Jr. once said of the fruit, “No other fruit, for me, is so thrillingly, intoxicatingly luscious…I’d rather eat one than a hot fudge sundae, which for a big Ohio boy is saying a lot.” Since 2006, private small volume orders for fruits grown in Puerto Rico were sold to American gourmet restaurants who serve the aril pieces as a delicacy dessert. Various parts of the plant have a history of use in traditional medicine, mostly in Southeast Asia; it may have been uses to treat skin infections, wounds, dysentery, and urinary tract infections. According to the American Cancer Society, “there is no reliable evidence that mangosteen juice, puree, or bark is effective as a treatment for cancer in humans”. Mangosteen twigs have been used as chew sticks in Ghana, and the wood has been used to make spears and carpentry in Thailand. The rind of the mangosteen fruit has also been used to tan leather in China. 1. Most fruits contain varying amounts of antioxidants, but mangosteen seems to specialize in them. Some of the antioxidants found in it include catechins (considered by researchers to be five times more effective at scavenging free radicals than vitamin C), stilbenes (which possess excellent anti-fungal properties, even after digestion), quinones (potent anti-bacterials), and a large number of polyphenols, which are even stronger antioxidants than vitamin E. Furthermore, mangosteens contain 40 out of the 200 xanthones known to science. Xanthones, which are extremely powerful antioxidants, are only found in a handful of tropical fruits and possess anti-allergen, anti-inflammatory and anti-convulsant properties. This makes mangosteen an excellent choice for treating asthma, eczema, allergies, fibromyalgia, arthritis, cardiovascular diseases and many other serious conditions. 2. Mangosteen is a great weight loss food for numerous reasons. Firstly, it is highly fibrous – one serving (100 grams) of fresh mangosteen contains 5.1 grams of dietary fiber, or 20 percent of an adult’s recommended daily intake. Fiber helps us absorb water from the colon, which makes us feel fuller for longer and discourages overeating. It also sweeps the intestinal tract of accumulated waste. Secondly, one serving of fresh mangosteen contains only 63 calories, no cholesterol and 0.40 grams of fat. Thirdly, mangosteen is a natural energy booster, making exercise sessions easier, more enjoyable and potentially longer-lasting. 3. Though mangosteen is primarily consumed for its antioxidants, it does provide us with varying amounts of macro and trace minerals. These include potassium, copper, iron, manganese, magnesium, zinc and calcium. These minerals work together to promote superior body health and play an important role in cellular metabolism. Potassium in particular is an important component of cell and body fluids and helps to control blood pressure and heart rate. Thus, mangosteen can protect us from strokes and coronary heart diseases. 4. Mangosteen contains respectable amounts of several B-vitamins, such as niacin, folate, riboflavin and thiamin. This chemically related family of nutrients helps the body to metabolize protein, fats and carbohydrates. B-vitamins also provide mood-boosting benefits, largely because some of them are responsible for making neurotransmitters like serotonin. This makes mangosteen a good choice of fruit for individuals suffering from depression and lethargy.